The new crash barrier right next to the shoulder of the fast lane south of Albany. Another update from the freeway beat about that cable barrier being installed on I-5 from the Harrisburg exit toward Albany: I’m wondering about its placement fairly close to the left-hand lanes. 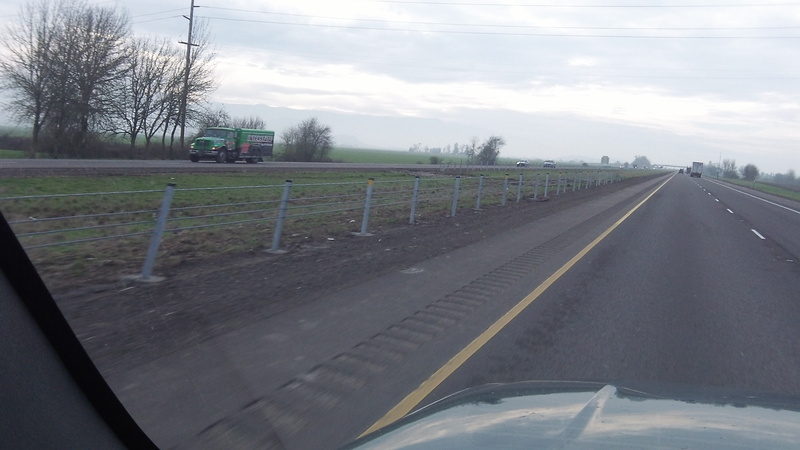 As you may recall, in November ODOT awarded a $7 million contract to a Salem company, K&E Construction of Salem, to build a three-strand cable barrier along 42 miles of I-5 in Linn and Marion counties. This was after cross-over crashes had killed three people near Albany and Salem earlier in the year. The Linn County portion is supposed to be finished in March, and drivers can see progress being made. And as you can see in the photo (sort of), the barrier is being installed pretty close to the fast lane, both south- and northbound. So what happens if somebody has car trouble in the left lane — the engine quits, for example, or a tire goes flat or blows up — and traffic in the right lane is heavy enough that pulling off to the right is not an option? Seems like the distance between the left shoulder and the barrier is little more than the width of a vehicle. Trying to stop on that side and pulling a safe distance into the median will not be possible. Well, from what I know, it is illegal to pull off on that side of the road, if your found doing so you will receive a pretty hefty traffic ticket. If you have car problems you are suppose to move over and park your car in the emergency area on the other side of the white stripe. I’m guessing they are anticipating that nobody will be breaking traffic laws, no different than concrete barriers in larger metro areas. You did state that you’re guessing the ODOT designers knew what they were doing. Are these the same quality of engineers that were involved in the State Route 20 debacle on the way to Newport? Just how many years and millions of dollars were wasted on that engineering mess?